Is the curious case of the €100,000 loan to his employer a bridge too far for John Delaney? It's a question that has been asked in a week that has brought the Football Association of Ireland (FAI) back into the headlines for all of the wrong reasons. The focus was supposed to be on Gibraltar today and the start of Mick McCarthy's attempt to reach Euro 2020, a tournament which will be partially staged in Dublin. But the FAI has spent the bulk of this week sending out statements related to its off-the-field management structures. The revelation Delaney gave his employer a dig-out in 2017 as a bridging loan to get through a cashflow problem has a significance beyond football circles. Taoiseach Leo Varadkar was dragged into the debate after Sports Minister Shane Ross sent a request for "urgent" clarification via Sport Ireland. At the beginning of next month, the FAI is due to appear at an Oireachtas hearing that was arranged long before this story sprung to light. It's an event that has gained greater significance now amid suggestions that whistleblowers have given committee members more information to bring to the table. Delaney (51) is no stranger to controversy within Irish football. He is the son of former FAI honorary treasurer Joe Delaney, who resigned from the association's board in 1996 when it emerged he paid a six-figure sum out of his own pocket to a ticket tout known as George The Greek. The purpose was to wipe out a shortfall in the FAI's World Cup ticket account. Within three years, Delaney had ascended to join the association's board of management as treasurer and he really sprung to prominence during the Saipan controversy in 2002. He was in Dublin for part of the frenzy and became a recognisable face on TV screens. Delaney also opposed plans to build 'Eircom Park' and his influence grew behind the scenes. In 2005, he was appointed chief executive. His tenure could accurately be described as eventful. Supporters would argue that he brought reform and helped grow the revenues of an association that was effectively driven by volunteers for most of its history. Critics would tackle his performance on the basis that the strategy to fund the Aviva Stadium, the most significant project of his stay, failed badly with expensive 10-year corporate tickets flopping and leaving the association with bank debt that reached €70m. The FAI has spent the past decade chipping away at that figure, with Delaney adamant it will be debt-free by 2020. But the extent to which it has affected the day-to-day health of the association has been a recurring topic. The "bridging loan" has added to concerns. Debates around Delaney's performance have been clouded by conflicting opinions about his personality. He has certainly not shied away from the limelight. During Giovanni Trapattoni's spell as Ireland manager, the sight of Delaney on the pitch after games became a familiar one, even throwing his tie towards adoring fans after one fixture. The administrator has said that he would prefer to be judged on policy, yet he has built a lot of support in the grassroots because of his willingness to visit clubs around the country and press the flesh. 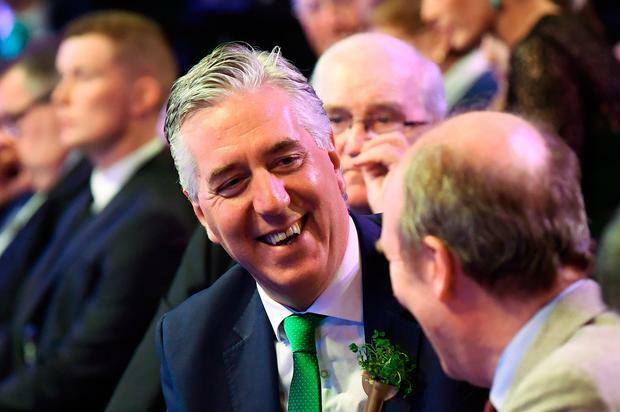 These are ceremonial duties that would more typically fall under the remit of the FAI president, but Delaney has made the effort to get out and about himself. But his socialising has posed problems on occasion. At Euro 2012 in Poland, he was photographed being carried through the streets of Sopot by high-spirited fans. "What happened one evening was a couple of hundred fans raised me up in the air and they carried me head-high home," he later explained. "Now if that's a crime, I'm not guilty." In 2014, he was recorded singing the republican ballad 'Joe McDonnell' in a Dublin bar. Delaney apologised. That was after lawyers had initially told English publications that he was not the man singing. A year later, he made the news outside of Ireland again when confirming that the FAI had secured a €5m loan from FIFA as a means of preventing legal action over the Thierry Henry handball that cost Ireland a place in the 2010 World Cup. This was another retrospective revelation that placed further scrutiny on the FAI's way of doing business - which is topical in light of the past week. Attempts to prevent the story from being published in 'The Sunday Times' suggest there were fears about the reaction. The FAI's financial review of 2017 made no reference to the €100,000 loan from Delaney - a director of the company - which was repaid two months later. He gave interviews that summer where he spoke about record levels of turnover. Varadkar articulated a common view when he said it was "unusual" that an association which deals with substantial amounts of money didn't have the facility to draw on a banking solution if it had a short-term problem. However, Delaney has asserted that he acted in good faith and FAI statements have said that the rest of his board were aware of all developments. A feature of Delaney's stay at the top table has been the absence of change around him. Seven months after he became CEO, the 10-man FAI board opted against renewing Brian Kerr's contract. Thirteen-and-a-half years later, six of those officials - Delaney, Michael Cody, Eddie Murray, Jim McConnell, Paraic Treanor and Donal Conway - remain on what is now an 11-person board. This week's FAI statements also touched on a proposed external review of their overall governance procedures which will be addressed in a forthcoming press conference. Earlier this year, they agreed a response to directives from Mr Ross related to term limits on the boards of sporting bodies - recommendations that highlighted the remarkably long service of the FAI's primary decision makers. There didn't appear to be much FAI appetite for reform in 2014 and 2015 when the minimum age for elected officers and council members was increased from 70 to 75. Indeed, association rules were amended to state that honorary officers over the age of 75 who were elected prior to February 2016 could seek re-election with no limit on the number of terms. That cleared the path for honorary secretary Cody and honorary treasurer Murray - long-term allies of Delaney - to continue in their positions for as long as they wanted if no other candidates emerged. They have stood unopposed through the current regime. Alas, the picture has changed due to the Government-driven directives. The FAI has introduced term limits of eight years for all new board members and Murray and Cody will not be standing again. The rest of the old guard will have moved aside by 2023. However, Delaney stands alone in being exempt from all of these changes because the CEO is a hired employee. It's the officer board who decide on his contracts and his future. His €360,000 pay packet is contentious, and has now been enhanced by a six-figure remuneration from Uefa where his political stock has grown to the extent that he was voted on to its executive committee. By contrast, the League of Ireland champions only receive €110,000 from the FAI for their troubles. He was stung last November when Liam Brady, a former assistant to Giovanni Trapattoni, admitted that he was beginning to wonder about the health of the game and what the direction from the top said about this era. "We've had 15 years of John since 2003 and I think the only progress is that John's career has gone up and up," he said. The question now is where he goes from here with changes in the Irish dugout failing to deflect attention from the FAI hierarchy's performance. He may return from the Rock of Gibraltar to find himself in an even harder place.